Posted November 5, 2013 by Eric Graham . While Google remains mum on the exact formulas they use to calculate quality score, there are a couple factors that we know for sure can help boost your click-through rate and increase overall quality score. These following 3 steps will help raise your score, and as an added benefit, help lower the cost-per-click, giving you more money to spend for clicks. Create ad groups with closely themed keywords. Having your keywords in tightly organized groups will enhance your quality score by creating relevancy between the user’s search query and the ad. Give your keyword list a quick audit, and if you notice one or two keywords that seem a little out of place, create a separate ad group for them. It is okay to have only a couple keywords in a group, and is actually recommended, as it leads to a highly targeted and effective campaign. The chart below is a great example that Google support uses when trying to explain ad groups. An online electronics store is wanting to advertise for televisions and cameras. 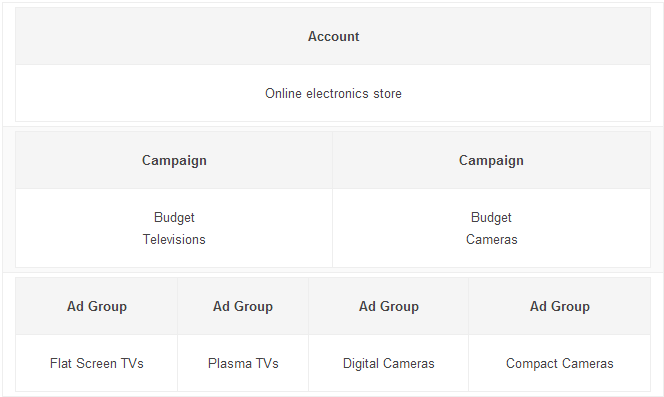 Instead of trying to group them into one campaign, the user separated them into categories, and added two ad groups per campaign that directly related to each campaign theme. The next step would be to then only include keywords that had to do with that specific ad group. If you have keywords that are commonly misspelled, such as jewelry vs. jewlery, create a separate ad group just for those keywords. This allows you to create separate ads with the common misspellings for that group, instead of harming the score of a regular ad group. By doing this, you will keep the overall score up within both ad groups. You don’t have to create brand new pages to be used as landing pages, but it is important to pick, or create, a page on your site that is utilizing the keywords that you have in your ad group, and if it doesn’t already, add them in appropriately. A benefit of creating a different landing page for each ad group is that you can specialize the call-to-action to whatever you are trying to sell on that specific page, thereby leading to more conversions. Do not direct traffic to your homepage. You must remember that campaigns need to be geared towards the consumer and should be taking them to the exact product or service they are looking for. Google definitely takes this into account when computing the quality score. If you do create a new landing page, keep in mind that you should only optimize the page for 3-5 main keywords. Avoid keyword stuffing! This means keeping all your keywords relevant to the content on each page. Do not overload a page with a list or group of keywords that are out of context. Google’s updates that have come out over the past few years has made the old practice of keyword stuffing obsolete, and will NOT help your organic or paid search rankings. Avoid writing generic ad copy. I like to research my competitors to see what they are doing for similar keywords, and make it different so it stands out. Take your top five keywords from an ad group, plug them into Google search, and examine all the ads on the first page. Note the calls to action and text. More often than not, you will see patterns or similarities between most of the ads. Get creative and find ways to incorporate fresh and creative text that will catch the eye of your potential customer. Make sure you are actually using keywords from that specific ad group in the header and, if it makes sense, in the body text of the ad. Users are more likely to click on your ad if the text matches their search query exactly, because it means you have what they are looking for. Test it and play with your keywords. Pay attention to the data; find which ads convert the best and restructure the ads accordingly. If you make these simple changes to your campaign, you will likely see positive results to your click-through-rate and quality score within a few days. For small budgets to high budgets, this is how to beat out your competition the smart way. Not sure where to get started with your Adwords campaign? Give us a call today to learn more about our comprehensive online marketing services, including a variety of Adwords packages to fit your needs and budget. From landing pages, to WebPresence(TM), we’ve got you covered. Start your integrated marketing plan today!